Don Bartola Bremuda, near Brescia, Italy. (Count Alessandro Contini-Bonacossi, Florence and Rome); sold 1950 to the Samuel H. Kress Foundation, New York; gift 1961 to NGA. According to Fern Rusk Shapley, Paintings from the Samuel H. Kress Collection: Italian Schools, XV - XVI Century, London, 1968, p. 90-91. Die Nacht [The Night], Haus der Kunst, Munich, 1998-1999, no. 9, repro. Paintings and Sculpture from the Kress Collection Acquired by the Samuel H. Kress Foundation 1945-1951. Introduction by John Walker, text by William E. Suida. National Gallery of Art, Washington, 1951: 275, no. 128, as The Adoration of the Child. Summary Catalogue of European Paintings and Sculpture. National Gallery of Art, Washington, 1965: 121, as The Adoration of the Child. European Paintings and Sculpture, Illustrations. 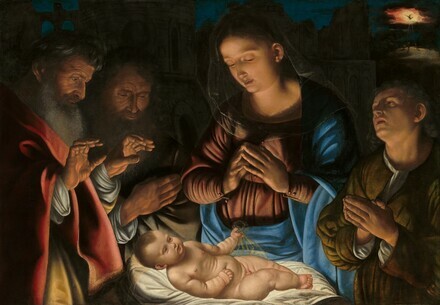 National Gallery of Art, Washington, 1968: 108, repro., as The Adoration of the Child. Shapley, Fern Rusk. Paintings from the Samuel H. Kress Collection: Italian Schools, XV-XVI Century. London, 1968: 90-91, fig. 217. European Paintings: An Illustrated Summary Catalogue. National Gallery of Art, Washington, 1975: 322, repro. Shapley, Fern Rusk. Catalogue of the Italian Paintings. 2 vols. National Gallery of Art, Washington, 1979: I:420, II:pl. 300, as Attributed to Savoldo. European Paintings: An Illustrated Catalogue. National Gallery of Art, Washington, 1985: 369, repro.